The summer season without a picnic is like strawberries without cream: possible, but lacking the flourish that makes all the difference. Wearing white tie, black tie, jeans or linen suits, the picnic can be enjoyed en plein air, under a gazebo, by a tree stump or in front of top-quality sport. It has become the defining activity of the British summer, but has been with us longer than we think. The picnic has its roots in the elaborate hunting feasts that preceded the chase in medieval times. However, the word itself does not emerge out of the lexicographer’s hamper until 1748 – one theory traces its origins to the French verb piquer, meaning pick or peck, with the rhyming ‘nique’ meaning trifle. Whatever its origins, a good picnic needs planning. Writing nearly a century ago, Emma Paddock Telford noted: ‘The pleasure of a picnic depends on the efficiency of its commissary department, and any serious oversight when one is 20 miles from a lemon or any other desired edible is a misfortune hard to bear’. Quite. In order to avoid pitfalls such as this?and to help you decide what to eat, and where, this summer?we have drawn up the ultimate picnic guide to the best that country and town have to offer. 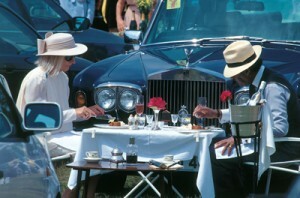 Serious picnickers are delighted that Ascot is back in Berkshire. Number 1 car park is still there, and the waiting list for it is down to a mere five years. Arrive early enough to watch the Royal Procession at 2pm. Do bring a picnic tea as well, as you do not want to be leaving straight after the final race at 5.30pm with the rest of the traffic (0870 727 1234; www.royalascot.co.uk). Cost: On average, 12,500 members pay £300 for a five-day badge for the Royal Enclosure. Junior badges (for those aged 17 to 25 years) cost £180. Royal Ascot is actively encouraging new and younger members; for details, telephone 01344 878476. If you are not a member at Henley, the Bubbly Barn Bar is an excellent spot, and there is parking available at the Remenham Farm car park and Remenham Meadows. If marquees, mahogany tables and silver cutlery are more your thing, ask a member to get you into the hallowed Stewards’ Enclosure between the Leander and Regatta enclosures (01491 572153; www.hrr.co.uk). Cost: Up to a 15-year waiting list, but two meetings have been held in the past year to increase the number of memberships, which cost £150 a year. Cross-country day (Saturday) is prime picnic time. This year, the start and finish will move to Ring 2, which makes the ha-ha lawn the place to sit. You can see the house, be in the centre of the action, and the trade stands are close by (01933 304744; www.burghley-horse.co.uk). Cost: Membership is £120 for the four days of the trials, together with £32 to reserve a picnic space. Taking place in an Area of Outstanding Natural Beauty, this event guarantees a great picnic spot for all visitors. Members can invite guests to join them in the coveted John Cowdray enclosure, or the Members’ car park, where there are spaces to set up elaborate gazebos (or where you can simply picnic from the back of your car) all a short stroll from the main grandstand. There are also lots of public picnic spots arena-side by the top goal. Get there early to reserve the best view. Gates open at 10am for the 3pm match (01730 814110; www.cowdraypolo.co.uk). This event is completely geared towards picnicking. The top alfresco dining spot is in the members’ car park number 3 trackside, opposite the finishing post. But with a 10-year waiting list, you might want to consider cultivating ticket-holding friends while you wait. Being on the top of the Sussex Downs, all of the car parks have wonderful views. Visitors can book spaces in the Three Furlong picnic car park, near the starting post, and in car parks 8 and 9, which have views towards the Solent and the Isle of Wight (0800 018 8191, www.goodwood.co.uk). 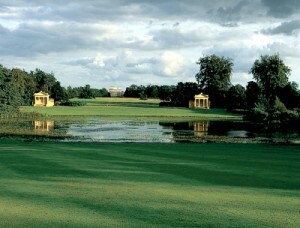 Cost: Membership is £335 (including £105 joining fee), which gives you access to the sublime Richmond enclosure. For membership details, telephone 01243 755022. 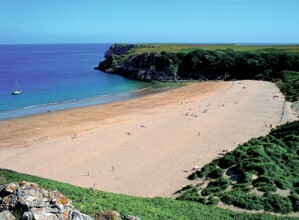 The wide golden sandy beach at Barafundle is ideal for picnics. You will have to carry your hamper on the short walk across the cliffs from Stackpole Quay – along part of the Pembrokeshire coastal path -to get there, but it is worth it. The dunes and pine trees on the western side of the beach provide the perfect shelter if it is windy. Brancaster has a vast expanse of sandy beach. The most scenic spot to picnic at is off to the east, looking across to Scolt Head Island National Nature Reserve, at the toe of the dunes that border the golf course. Picnic in the marram dunes on the west coast of Harris, facing north, for the best views of the Harris hills. Cost It is hoped that the list will be re-opened within the next 10 years. When this happens, the annual fee will be £140. In the meantime, telephone the box office for returns. Pick a spot on the northern fringes near Kenwood House for fabulous views of the capital. Book into the hotel to gain access to one of London’s most exclusive picnic gardens. You can ask for anything you want from the hotel and order more from your idyllic spot via a mobile phone supplied by the hotel (020 7235 5537; www.durleyhouse.com). Cost: £625 per night for the best suite. Find a quiet spot overlooking Pen Ponds, one of the best areas for a picnic in the 2,500 acres of hills, woodlands, ponds, gardens and grasslands, where there are 650 free-roaming deer. Set up in the shade of a gnarled oak tree, to the right of Stowe’s famous Palladian Bridge, and enjoy views across the lake to the Gothic Temple. A short walk from Waterhead, in Ambleside, through secluded Skelghyll Wood, brings you to Jenkins Crag where there is a flat promontory perfectly situated for a cliff-top picnic with views over Lake Windermere. Either picnic on the cliff tops overlooking Kynance Cove, or right at the end of the Lizard peninsula -the most southerly point in Britain.